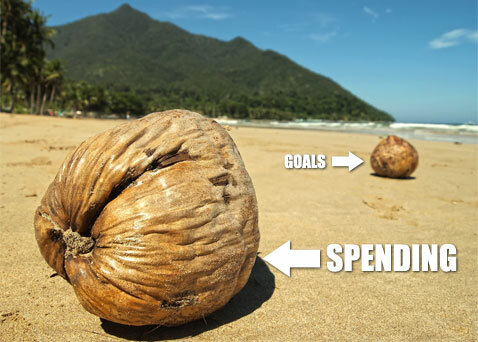 What Does Your Spending Say About Your Priorities? One of the most challenging aspects of personal finance is identifying what is important — and then keeping your spending in line with what you value. Because personal finances are, well, personal, each person has their own ideas of what is most important. They key is to decide what is important to you and then create a spending plan that reflects your priorities. Different people value different things. Before you can create a financial plan that reflects your personal values, you need to reflect on what you value. If you value more time with your family, you might choose a career path that allows you to be at home more, or you might move closer to your work so that time isn't spent on the commute. If helping others is important to you, chances are that you donate money to charitable causes or volunteer your time. Those who enjoy travel might spend money on vacations or frequent mini-trips. Others prefer to stay home, and spend money on making their homes as comfortable as possible. Deciding what is most important to you is not a matter of “right” or “wrong”. It's more of an issue of what you prefer. Write down the things that are most important to you, and then rank them. Be quite honest. If saving up for a family vacation is more important than giving money to the food bank, rank your list in such a manner. I don't care if I leave a pile of cash for my son to spend after I'm gone, so my financial priorities focus on a modest and adequate retirement fund, with a bigger budget for fun now (including family fun). My husband and I have always believed that giving to our church is a must, so our spending has always including tithing. However, not all of our spending has always been in line with our priorities. We enjoy eating out and trying new foods. For a while, though, we had a premium cable package — even though we don't watch that much TV. We realized that by scaling back the cable package, we could eat out more. We barely miss the premium cable channels. Of course, the value my husband places on ESPN, NFL Network and MLB Extra Innings is the reason that we still have cable at all. Look over your spending, and see if it matches with your priorities. If you have listed early retirement as a priority, it doesn't make much sense to spend money on a new car. Instead, put more money toward your retirement fund, and buy a less expensive used car. If your biggest priority is paying down debt, look at your spending. Are you buying lunch every day or getting the latest movie when it comes to DVD? This doesn't jive with your debt pay down priorities. Be honest about your spending, and how it matches up with what you actually want out of life. Then see what adjustments can be made so that your spending matches your values. Does your spending match your values? What things could you cut to better meet your goals and priorities? My goal was to max out my retirement savings (403B, IRA & Roth IRA), so I started with that dollar figure. If I needed to make changes to other things to meet my goal, I was willing to make it. That works for me! My goal is to purchase a home and to that end I’ve downsize my lifestyle to increase my saving. Taking care not to completely deprive myself because in the past the strain made mw lose sight of my goals.